Family Friendly This trail is super easy to get to and hard parts can be skipped by riding on the paved trails. Be aware that some sections are technical and may prove unsafe for youngsters. This trail is built in a valley so be mindful that riding in rainy / wet conditions will damage the trail for everyone. If you are making a rut, stop riding. The Upper Lake Main Loop is a unique trail as it is located in the heart of the city of Port Washington. Designed to flow next to the interurban paved bike trail, this trail features some challenging turns and climbs along off camber sections to challenge riders. The trail follows a small creek and crosses the creek several times during the ride. You'll encounter the first crossing over a wooden bridge that is shared with light pedestrian traffic. From there, the trail drops into the woods and you'll find yourself twisting and turning and getting a little wet while crossing the creek. At its north end, the trail crosses a road, Hales Trail, so be mindful of the signage and check for traffic. You'll have another creek crossing in this northern section. The trail then loops back south with an exciting and challenging downhill section. At the bottom of this section be aware that there are some very flowy rollers, but you'll need to stop in order to cross the Interurban Trail and continue on the southward singletrack. This crossing is marked on the map and is also marked with a stop sign on the trail. After this, you'll be riding singletrack all the way back to your start. Remember that Port also offers two beaches that are open to fat biking and has great coffee shops and restaurants downtown to enjoy before or after your ride. Trail is in poor condition. Do not ride until updated. Trails have been snowshoed and ridden in. Ready for fat biking! There are easier options available that allow you to bypass some of the harder hills. 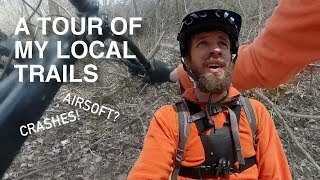 A tour of the Port Washington trail system.